The Pareto Principle, introduced in 1906 by Italian economist Vilfredo Pareto and developed further by Joseph Juran, is widely known as the 80/20 rule. It states that in every event, 80% of the outcomes are contributed by 20% of the causes. Believe it or not, this has a heck of a lot to do with recruiting top talent! But perhaps not in the way you imagine. 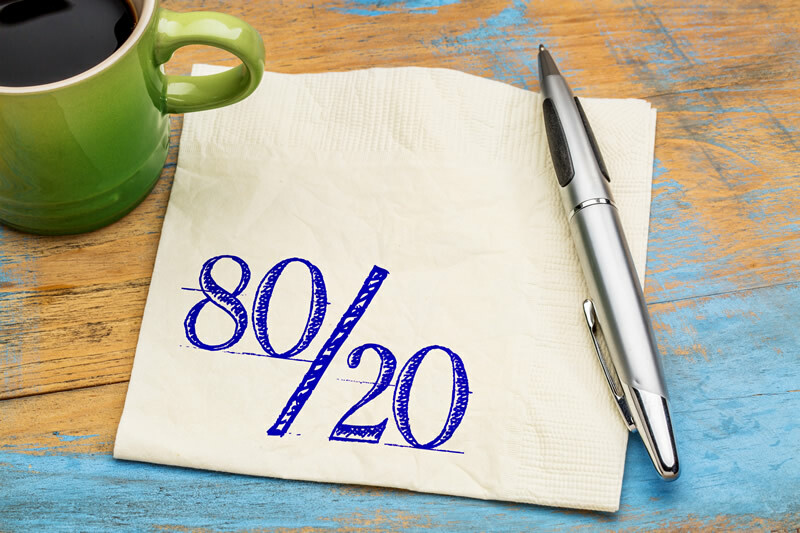 In the old recruiting model, the 80 / 20 rule was used to mean that successfully filling a key position depended 80% on finding the right candidates, and 20% on everything else. Emphasis was on identifying potential candidates. Like many things that have an impact on organizational performance, however, recruiting is changing, probably more dramatically than most others. Social Media and readily available data have made it much easier to find individuals with the desired background and experience. And this, in turn, has given us yet another meaning to the 80/20 rule. Emphasis has moved from identifying individuals who have appropriate knowledge and experience to making certain the person who joins the organization fits. This perspective has flipped the rule. Today, only 20% of the success in filling a position is based upon identifying potential candidates and 80% of the success is determining their ability to be successful in the future in the specific organization. Aligning the context of the role with the culture, strategy and purpose of the organization defines the backdrop and is the yardstick against which to evaluate each candidate. This is the “magic ingredient” that enables organizations to hire for the future. The result is a powerful approach to determine how well candidates fit the role and the organization and how prepared they are for the long-term. This new 80/20 mindset represents a significant shift from recruiting someone who can fill your open position. It requires understanding your organization’s strategy and the candidates’ potential. It takes commitment and effort to approach a recruiting project in this manner; not all organizations are prepared to do so. Before you fill your next key position, analyze how it fits the organization’s needs – not just today, but going forward. Resources committed to making this an impactful hire will be a sound investment in the organization’s future. As Ralf notes, there are consultants who help organizations do this — to future-proof the talent within the organization. Their approach requires working with the stakeholders to identify what the role requires and to understand how it fits the organization. It dramatically reduces the risk of the selection. These professionals have embraced the new 80/20 rule. You won’t find them sending you a bunch of resumes and hoping something will stick. Instead, they want to partner with you and are as committed as you are to the successful hire. Larry Shoemaker is President of Shoemaker & Associates/Cornerstone Atlanta. He helps organizations identify, recruit, assess and retain talent. He is also President of Cornerstone International Group, a global retained search organization comprised of about 70 independently owned offices located around the globe, with headquarters in Shanghai, China and Atlanta, GA. He holds an International Coach Foundation ACC Credential.